To play any music on Mac or various players and devices, you can use the audio converting tool by iSkysoft to convert audio to MP3, WAV, WMA, M4A, AAC, AC3, AIFF and so on. To start with, drag & drop audio files to the program. Or click "Add Files" button to load videos to be converted, you can upload from hard drive, mobile devices or camcorder, even from DVD folder. 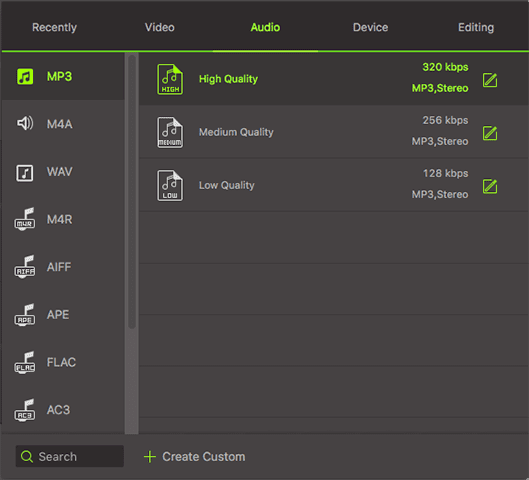 As you can see, there are many audio formats in the “Audio” category of the right format tray. Just select the audio format according to your needs. Meanwhile, you are able to change the encode settings of the output format by clicking on the gear icon changing for example the bitrate, sample rate, channel, etc. Or simply choose from the high quality, medium quality and low quality options to one click set your output audio quality. After setting the audio output format, now you can select the output folder by clicking Menu > Preferences > Location and then click the “Convert All” button to complete the audio converting process, or hit "Convert" button on the right of each item to convert audios one by one.